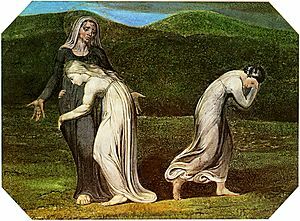 The Book of Ruth (meaning pity or compassion) is the eight book of the Old Testament (Christian), and the Tanakh (Jewish). It is one of the shortest books in both the Jewish and Christian holy books, consisting of only four chapters. It is unknown who wrote the book. Some think that it was written by Samuel, but there is no evidence for that. According to many scholars, this book was originally part of the Book of Judges, and was later taken from that book and made independent. It was probably written around 900 BC. The book tells the story of the family of Elimelech, his wife Naomi, and their sons Mahlon and Chilion. Because of a famine, they were forced to leave Bethlehem and go to the land of Moab. Once there, Elimelech died, and his sons married two Moabite women. Mahlon married Ruth, and Chilion married Orpah. After some time there, Mahlon and Chilion both died. Naomi was forced to return home because her husband and sons were dead. She then told Ruth and Orpah to return home to their families and find new husbands. Orpah returned home but Ruth promised she would follow Naomi wherever she went. 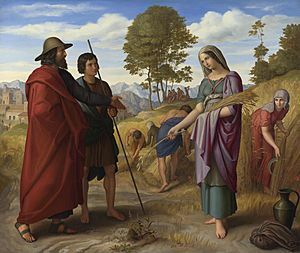 They returned to home and Ruth decided she would go into the fields to pick up grain the wealthy people would drop on the ground (a common practice in that time). A kind man named Boaz, who was the owner of the field, noticed her and her beauty. He told his workers to drop extra grain for her. When she went home to tell her mother-in-law how much she received, they found out that Boaz was a close relative of theirs. After an even closer relative said he would not marry her, Boaz and Ruth were happily married. She would bear him a son named Obed, who was the father of Jesse, who was the father of David, who was, according to the New Testament, the ancestor of Jesus. Book of Ruth Facts for Kids. Kiddle Encyclopedia.